10x FREE Bonus Packs Of Electrodes Included With Each Unit! 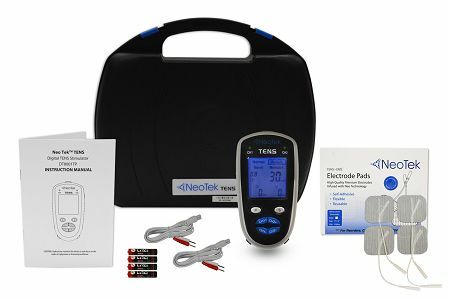 The NeoTek™ Digital TENS is a portable, easy-to-use device that combines TENS (Transcutaneous Electrical Nerve Stimulation) with new and improved Neo-technology to address pain therapy in targeted, pre-set body part treatment modes. It is a two output channel TENS unit, allowing the use of 2 or 4 electrodes at a time, that is highly effective in relieving pain. TENS is a non-invasive, drug free method to control your pain by sending tiny electrical impulses through the skin. In many cases, this stimulation will greatly reduce, if not eliminate, pain, allowing for a return to normal daily activity. TENS is also now regularly recommended by doctors, physiotherapists, and other medical professionals throughout the world. The tens unit has been very beneficial to me. I've had back problems for years, now I have much relief. Thanks! Plenty Powerful enough for such small size! Sufficient Variable wave lengths, which are broke down in the instructions, so you know best which one to use for where! LOVE the Duel Outlets, for 2 spots at the same time- yet individually controlled! I would recommend this product for a "middle of the road" price. Good buy for the Money!! This product has given me my life back, I am 25 and suffer from chronic pain, I couldn't even go to the store. Ever since I received this it's made my life so much better I love the preprogrammed settings I don't have to mess with anything just turn on to the area and I'm good yo go. It's compact and hooks right to.my pants so I can carry it anywhere, I found if I clip it to the inside of my pocket it stays better. Overall I'm in love with my unit and I take it everywhere. It's great for pain works really well if you don't want to take pain killers. I highly recommend. Item came with everything that is stated on the website. The functions on the unit are not easily programmed as they state in the directions. It should have pictures of what item you are trying to use product on. No one will remember the number system if they have to use it on different areas of the body in which I do. Knee, hip, back, leg etc. Very happy with this item. This was a replacement for an older version ance it was so much better! Excellent value. Wonderful service. The best online. The TENS unit is a lifesaver. The product is top quality. I’ve used it on several areas of my body and the pain was reduced to minimal, then no pain. I love the case it came with which keeps everything together and easily accessible. I highly recommend this product to everyone looking for a top quality unit. I purchased this tens unit 3 months ago. It is just as advertised. It is excellent in relieving my knee pain. It comes with a bunch of electrodes which is a nice bonus. I use this for school athletics. I is just as good as the big bulky unit we use to have. Love the portability. This is by far one of the best units I have ever experienced for my chronic back pain! Works great. It is just what I needed to help with a chronic muscle issue. To date, this unit works very well for the price. I have lower back pain, shoulder pain that is greatly reduced by the TENS unit, without prescription drugs. The unit is high quality and I recommend it compared to other high priced products. I purchased a higher price unit for 6 times the price and it does not perform 6 times better. I like the size and portability. It has decent features in various patterns. It does go through batteries but that is the sacrifice of a portable unit. Very pleased with my purchase. 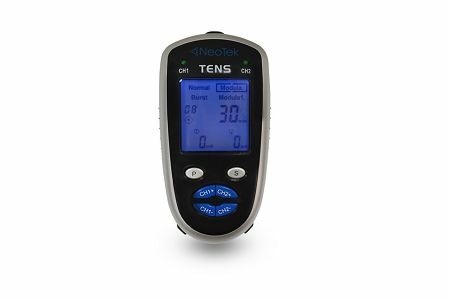 The Neo-Tek Digital Tens has helped my lower back issues. Very nice product. Easy to use with several settings. Q: Do I need to buy the electrodes, etc. separately or what is included with the unit? A: The NeoTek TENS unit comes with everything needed to start your electrotherapy treatment right away. 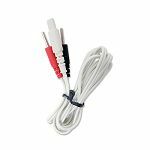 It is recommended to stock up on extra electrodes if you plan to use the device often, in order to save on any future shipping costs. All supplies, such as electrodes, lead wires, batteries, etc. are available for sale separately. Q: In addition to the "pre-set modes" can the intensity be manually controlled by the patient? A: Yes, the intensity of the stimulation (pulse amplitude) is always adjustable by the user. Q: How often do you change electrodes? Can you use them more than once? A: The electrodes are self-adhesive, meaning they already have the adhesive gel on them, ready to go, and most users will typically get around 8-12 uses per pack of 4. This does vary on such factors as how long you use them at a time, storage conditions, skin type, etc., so it will always vary from patient-to-patient.